HAND+made by Clairmont & Co. Downtown Laurel has always been a hub for people and ideas that are truly great. Supremely talented craftsmen, artisans, and creatives of all kinds proudly call The City Beautiful home, and they are bringing Laurel back. HAND+made by Clairmont & Co. is truly one of the most innovative and creative businesses to meet Laurel’s Downtown to date. Stephen and DeShawn Clairmont built their first business, Clairmont & Co., to a well-known wholesale giant in the South just before this newest venture. Now, they’ve stepped it up even higher and brought us HAND+made, an integrated retail and DIY shopping experience. The store incorporates handmade goods to shop for, as well as goods for you to make. With wooden letters to candles, there’s something for just about anyone. 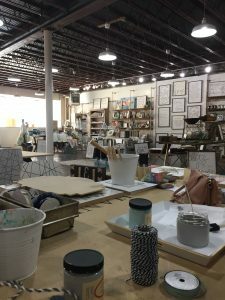 Their prices range from around $6 to $40 in crafts, so you can make it as affordable as you want while having a large selection to choose from. HAND+made is great for kids, dates, and parties too! Also, they host classes and workshops frequently and do special limited time projects. This week, we went and tried HAND+made out for ourselves. The process was so easy and fun, we highly recommend it to everybody! I immediately was given the grand tour and shown everything there was to pick from. I chose to make a candle and went ahead and picked out my scent. 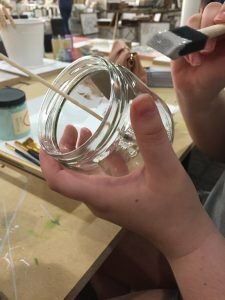 They gave me a glass vessel to paint and ribbons to choose from. Then, I got to mix my scent and pour my own candle! It means so much more to have handmade products and decor in your home, especially if they were made by you! I for one was very impressed by my experience at HAND+made and will definitely be returning again. At Lott Furniture Co., we can’t wait to see the spark of creativity that HAND+made will light in our community. Offering up a place for us to all become makers together is a very special thing that will hopefully be cherished for years to come. 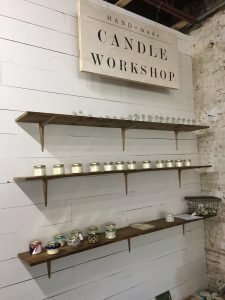 If you haven’t made it over to HAND+made yet, get over there! And when you do, be sure to give Stephen and DeShawn some neighborly love and congratulations for their amazing new business. Be sure to sign up in the gold box to receive updates every time we post! https://lottfurniture.co/wp-content/uploads/2017/07/Untitled-design-10.png 1055 3000 Keri Rowell https://lottfurniture.co/wp-content/uploads/2016/09/LOTT-ICON-100-WHITE-300x281.png Keri Rowell2017-07-21 10:00:232017-07-20 13:34:29HAND+made by Clairmont & Co.
Keri, thank you for this piece! I think Hand + made would be a good place for a senior group to go! I’m going to pass this on to Mom!